More and more frequently I have found that people who seek me out as their coach have relationship issues. That may not be their initially stated reason, but eventually it surfaces. Some time ago I was corresponding with a client on this topic, and some words came to me. As I re-read them today it occurred to me that these words, plus additions that I made later, might be helpful to others today, even though they were originally written some years back. Naturally I have changed them to hide identities, and to make them more generally applicable. Remember that you had good times in your life before you met this special person. This proves that you do not need that person in your life in order to enjoy yourself. Whatever happened, you have learned and grown while you have been in that special relationship, and that perhaps that growth was, in the grand scheme of your life, what was important. Know that what will be, will be, and that sometimes we find the most peace by going with the flow. Perhaps the two of you will find that you can continue in a friendship, perhaps not. It could be that the two of you will find a way around the difficulties that seem to be driving you apart. On the other hand, perhaps it is time for your paths to diverge. Whichever way it goes, you cannot impose your will on someone else. It takes two to tango, and it takes two loving people who are willing to work hard at it to make a healthy and happy relationship. Unfortunately, though, it takes more than love alone. Whatever the two hold most valuable must be compatible. They do not have to agree, but what makes one happy must not be what would make the other unhappy. If that compatibility cannot be achieved, then what is most important is that you continue to live your own life. More, that you life it in a way that is rich, fulfilling, and that furthers the growth that you have seen seeking, with or without the loved one. Doors open, doors shut, doors open. It is the same with windows. Every ending is just one side of the coin – the other side is a beginning, for no active phase of our lives can end without another phase beginning. Know that what matters most is that you be true to who you truly are, at your innermost core. To go into, or to stay in, a relationship that denies a part of who you are is to kill off a part of yourself. If a way can be found for you to be accepted fully, then that would be wonderful. However, always remember that you as your whole self are more valuable than any relationship can ever be. When you are not whole you cannot be wholly in a relationship, and that relationship therefore cannot be all that it needs to be for either of you. Another view is that if you are not whole, then your partner is not partnered by a whole person, which is something that all of us deserve. Equally, you deserve to be a whole person, and not to deny yourself to suit somebody else. An ending will hurt. That is inevitable. Yet it is the end of something. It is not the end of everything. You existed before, you laughed and were happy before. You can laugh and be happy again. Give it time. I hope you find this blog interesting, useful, or amusing, depending on its topic. One way to keep track of my posts is to subscribe to my newsletter (see form on the right), which will always contain a link to my recent blogs. Or, of course, you could bookmark this page and keep checking back. Either way, I hope that my work makes your life easier and more balanced. To explore my offer of the gift of a 30-40 minute coaching session on whatever issue is a stumbling block for you, please see my Contact page. Sometimes we get stuck. Sometimes it feels as though there is no way we can get unstuck. But we can. 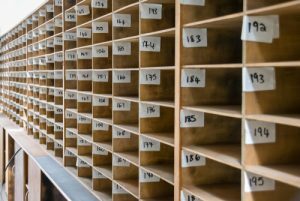 A while ago I had written about the spiritual practice of patience, of just waiting, and preparing, as one waits, for whatever is to come, known or unknown (and, truly, it is always unknown – but that is for another blog). There are many reasons why one might be “stuck on the couch,” either literally or metaphorically. But to know how someone could go about getting themselves off the couch, one would need to know why they are ON the couch and unable to get off. If we find ourselves in this state of mind, perhaps we could ask ourselves some of these questions, and see which ones resonate. Do we feel that getting off the couch and moving into action will be useless? That whatever we do, we are not capable of achieving anything worth achieving? When we get into this state of feeling that we can achieve nothing, it is very difficult to break out of the cycle. Among other things, I urge such folks, who are often coaching clients, to make a list of their achievements, and re-read it every day. To think carefully, to go back over time to any time when they were proud, when someone praised them, when you achieved something you were working on, even as a ten-year-old. You HAVE achieved. Be proud of that fact. Other techniques include: to be determined about writing a gratitude journal every day, to find someone worse off than you who can benefit from your help, and/or to let people know that you need encouragement and are feeling down. This last can be very difficult, since society tends to teach us not to admit to being vulnerable. Yet people are usually more willing to respond warmly and give encouragement that we give them credit for. If you literally know no one to whom you can turn, find a way to widen your circle of friends. Network. Consider seeking a mentor or a coach. Other questions: Have you given up on your dreams? Do you no longer believe that they are worth having? Do you have no dreams? Another question: Have you allowed your body to get into the habit of not moving much? Sometimes our bodies can get so lazy that we feel too tired to move off the couch. Many years ago a doctor, to whom I had complained of feeling tired all the time, told me, “Then you need to exercise more.” Even though exercise may tire us temporarily, in the long run (no pun intended) it invigorates us. It is also a powerful antidote to some. though not all, forms of depression. While on the topic of depression, there may be therapeutic reasons that keep you on the couch. It may be that you are in a state of depression that calls for time to be spent talking with a counselor, in which case I urge you to find one. Depression can be a downward spiral from which some people cannot emerge without professional help (and no, going to a counselor is not the same thing as hiring a coach – as a general rule coaches are not licensed therapists, though a few are). Assuming you are not so serious a “couch potato” as to need therapy, I suggest that you put together a schedule for yourself that includes most or all of the techniques I have suggested above… list your achievements and savor them, keep a daily gratitude journal of at least five items a day, examine your goals and pick one to work on, and schedule yourself to do some form of exercise (other than walking to the refrigerator!) several times a week. Commit to yourself that you will keep up these habits for a month. Do it. Then, let me know how you feel. Jumping to conclusions can land us in the wrong place. We are rushed, we are pressured, and we don’t have time for the fine details. Instead, too often we mentally leap to the bottom line, and in that leap we often fly past a few things that could lead us to more accurate understanding. We may read that a dietary product provides “Up to 4 hours hunger control,” but how many of us remember that “up to four hours” includes one, two and three hours as well as four? Sometimes we even teach others on the basis of our wrong conclusion. The simplest answer is NOT always the correct one. How often have you read or been told that words carry only 7% of the information conveyed in communication, that 38% of the information is conveyed by tone of voice and 55% by body language? You can find this misinformation in many books and all over the internet. It has been quoted in learned papers and taught by at least one national training organization that really should know better. It is wrong, and yet it is based on some excellent research by a professor at the prestigious University of California at Los Angeles so… how can it be wrong? It is wrong because somebody, somewhere, over-simplified. No doubt in a hurry, or because of a word-count limitation assigned by an editor who in turn was bound by page space, a very important piece of information about that research was omitted, not by the original researcher, Dr. Albert Mehrabian, but by someone in the subsequent reporting chain. The fact is that Dr. Mehrabian was not researching communication in general. He was very specifically researching the communication of feelings. So when we say that 55% of the information about how someone feels is conveyed by body language, we are quite likely to be accurate. Think about it. How often can we tell how someone is feeling just by the way they move as they enter the room? The way they walk, hold their head, the droop of their shoulders, the expression on the face… oh yes, we can see Dr. Mehrabian’s research as solid. That does not mean that we know anything more about that person’s situation, about any information they may have received that led them to feel that way. It just means that we can have a fairly good idea about how the individual is feeling. Yet, because someone over-simplified, misinformation is passed on around the world, and courses on body language are seen as even more essential to interpersonal success than they actually are. Don’t get me wrong – body language IS important. However, it is extremely unlikely to carry 55% of the meaning of whatever interaction you may have with someone who is reporting on what is going right or wrong with a project, or if they are training you on the policies and procedures of a business, or even discussing plans for a vacation. Body language does not convey facts unless those facts are actually feelings. One term for what happens when this type of mistake occurs is “over-generalization.” Someone took a specific situation and assumed that it applied in a much broader context than was correct. This happens a lot. A child told that a large furry animal in a field is a cow is likely to call all horses and camels “cow” until it learns better. That is over-generalization. As adults, do we really know if research done with white male college sophomores from an Ivy League college can be generalized to group of people who are far more diverse in race, age, gender and life experience? The results may indicate a possibility, even a probability, but if we are to avoid over-generalization it needs to be replicated with a population that is far more diverse in race, age, gender and life experience before it be applied to the majority of people. Yet that, of course, is exactly what we do when we stereotype. We take an experience, or an incident, and assume that it is always going to happen in the same way based on whatever is most noticeable about what happened. We take a person who behaves in a certain way and assume that all people like that person have the same behaviors or beliefs. 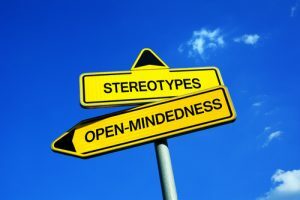 Not only do we base stereotypes on our own experience, but on what we have read or heard from others, whose knowledge may be even further removed from the truth. Anyone who talked to Dr. Mehrabian about his research would have learned the truth, but the further the misinformation traveled, the more firmly wrong it was. I once started work in a new environment in the U.S. and found myself welcomes warmly by all the staff… except one. She – I’ll call her Susan – was barely civil, and would often not respond to my cheerful “Good morning.” When she did she mispronounced my name often enough that it appeared to be deliberate. It took a while, but after some months she began to relax, and confessed to having been influenced by an episode in her teens. Her family spent some time in England, and after having become accustomed to American high school life she suddenly found herself in a far more highly structured English school being taught, and reprimanded, by English school teachers who did not appreciate her introduction of American ways and accent into their domain. She remembered the experience as truly horrible, and still hated the memory of her teachers, who were all middle aged women with, of course, English accents. Many years later, with my English accent still noticeable, I kicked up all the youthful anger and resentment she had stored up since that time. She had taken the past situation and over-generalized it to “all” middle-aged English woman – in this case the “all” being me. Stereotype. And, as she eventually realized, inaccurate. Yet it certainly slowed the efficacy of our work together. Sometimes, when we over-generalize, or stereotype, it can hurt other people, as her lack of welcome hurt me. Sometimes it can be harmful to those who do it, and who act or make decisions based on inaccurate information. When a stereotype leads us to underestimate other people’s knowledge or abilities, it can indeed be harmful to us as well as to them. A bluff may be called. An employer may pass over a potentially brilliant employee who could do much for the organization. A competitor, under-estimating the abilities of other competitors, may not train or practice sufficiently prior to the contest. Serious, and maybe irrevocable mistakes may be made. “Insufficient information” is the typical response from computers when asked to solve a problem for which the data provided is insufficient. It is worthwhile for us to take the time, and make the effort to check on whether or not we, too, have sufficient information before we make assumptions, and even more so before we act on them. An assumption that hunger is controlled for four hours can leave us hungry, even with dangerously dropping blood sugar, long before we had planned it to happen if we assume that “up to four hours” means “four hours.” It doesn’t. We all tend to do it. 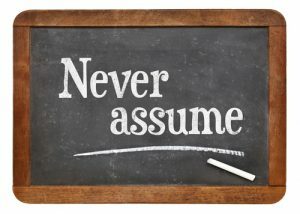 Are there unfounded assumptions are leading you astray from your goals? Please let me know your thoughts about this post, or the website in general, in the comment form below. And feel free to contact me any time via the Contact or Subscribe pages.